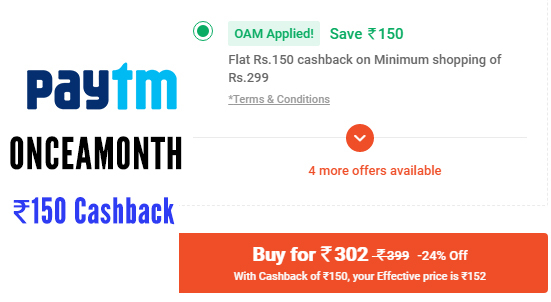 Paytm Mall ONCEAMONTH offer is back with new terms and conditions. 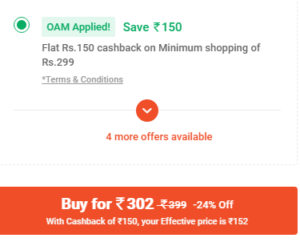 Now you can get flat Rs.150 cashback for shopping over 299. Groceries Products are not eligible for this offer. 2. Open Website & Login with Your Paytm Account. 3. Buy Any Product Rs.299 or More. 5. Then Click On Buy Now Option. 6. Now Select Your Delivery address & Proceed To Pay. 7. Your Order Place Successfully & You Will Get ₹ 150 Cashback when your product got shipped. 8. Effective Price ₹ 150 Only.